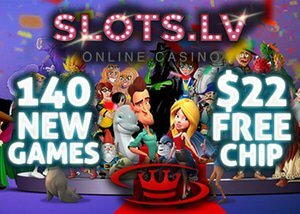 Slots.lv have just added 140 brand new games to their line up and to celebrate and give all their loyal fans a chance to test them out they are offering a fantastic $22 no deposit bonus to all players who use their special coupon code. What a great way to kick off the addition of 140 exciting new games, and what's more with this no deposit bonus you can try them all risk free and hopefully get a couple of lucky spins too. Slots.lv now have over 400 casino games as well as a selection of Rival titles which includes some great new interactive i-Slots. If you haven't played i-Slots before, it is because they are an exclusive feature that can only be found at Rival Powered sites. These interactive slots games are story-based and as you spin the reels you get to progress through the story. The reels and graphics change as you progress through the game making them fun and entertaining for all slots fans. There are some great new themes added to the line-up including Panda Party that features 5 reels, 20 paylines, free spins, wild multipliers, and a whole lot more. Other titles include As the Reels Turn which has some great plot-twists to keep everyone entertained and coming back for more. The $22 no deposit bonus that all players can avail of is a free casino credit bonus that can be used on the new slots games. If you like what you find, you can avail of a fantastic $5000 welcome package when you begin funding your account. The welcome package is broken down into a 200% match bonus up to $1000 with your first deposit and a further eight 100% match bonuses up to $500 each. The free cash isn't limited to just slots either and you can use it to test out the keno and scratch card games offered on the site too. 140 new games is a lot at one time and some of the new Rival titles including Vintage Vegas, Whale O' Winnings, Mystic Wolf, and Blazin Buffalo. All come with great features including scatters, wilds, and great free spins bonus that can be triggered as many times as possible. There are also multipliers that will help boost your winnings too. If it sounds good to you be sure to take advantage of this amazing no deposit offer and get your hands on $22 in free casino chips today.